Vowelor Books App | Find What to Read Next & Never Read Alone! Books added to their Libraries by the Readers. Viral bookish stories shared with the Readers. Bookclubs created by fans of different authors and genres. “What Should I Read Next” is the most common problem that readers have since the day they finished reading their first book. If you are also hunting for the next good book to read, we have a solution to that! With Vowelor app, you can now find the book that you should read next in a whole new way! Vowelor app’s Find Next Read feature recommends you books according to your current mood. Is this magic? Well, kind of. All that happens in just three words. Here’s How! Download the Vowelor App and sign up. After completing the sign up process, go to Home. Click on the Find Next Read option in the bottom menu. Fill three words that best describe your current reading mood in the provided fields. Click on the Go icon. Vowelor app will give you book recommendations according to your mood. 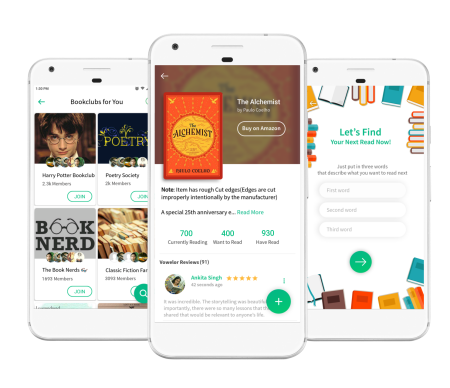 It simple, its innovative and uses refined algorithm to recommends books to read next. Vowelor app gives you the freedom to create your own book clubs and invite your friends for a bookish journey. The app also recommends you book clubs that you must join according to your reading habits. You can join fandoms of your favourite book series or authors or even genres that you like the most. Every bookclub on Vowelor app lets you share your bookish thoughts in form of posts and pictures. You can interact with other readers and writers on their posts. So, What are you waiting for? Good Books become better when read together! Vowelor app connects you with people having similar reading habits as yours! You can even chat with readers reading the same book as yours. Another magic! Well, yeah. Don’t be an introvert reader anymore. Discover Avid book lovers who share the same reading interests as you. Chat with fellow book lovers in real-time & discuss your favorite books and characters with the Meet Fellow Readers feature. Make new bookish friends so that next time you have a book haul, you have someone to brag about! Always asking your friends what they are reading? Vowelor app lets you follow libraries of the readers whom you find interesting. And, the next time they add any book to their libraries, you’ll get a notification automatically! Its an all new way of discovering new books that you should read next. Did you miss the release from your favourite Writer? Not any more. Never miss out on the latest happenings in the bookish world. With Vowelor, be the first one to know about new book releases, book reviews, trending content and much more.